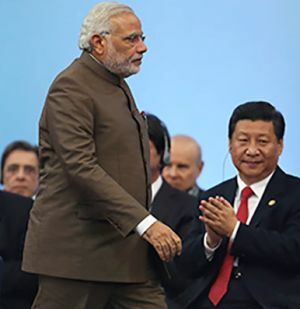 Prime Minister Narendra Modi has pipped Chinese President Xi Jinping to secure the top rank in handling domestic and international affairs in a global survey conducted by a Chinese firm. In the 'China's National Image Global Survey 2014, conducted in 9 countries -- the US, UK, Australia, Japan, South Africa, India, Russia, Brazil and China -- Modi's handling of domestic and international affairs has won him the top rank while Xi figured second. "Xi's handling of both domestic and international affairs has won high praise. He ranks second, after Indian Prime Minister Narendra Modi, for his capability of handling domestic and international affairs," Wang Gangyi, vice-president of China International Publishing Group, said citing the survey report, which was released in Beijing on Wednesday. The survey, based on 4,500 respondents from the 9 countries, was conducted by the Centre for International Communication Studies of China Foreign Languages Publishing Administration, Millward Brown and Lightspeed GMI. The survey, which did not include China's close ally Pakistan, found that Beijing's overall image has been increasingly recognised by the global community. The "More people in the nine countries are convinced of China's future robust economic growth," Wang was quoted as saying by state-run China Daily. The average score of China's national image in 2014 was 5.9 on a scale of 1 to 10, up from the previous year's 5.1. The survey found that Xi was the fourth best-known among the leaders of the 9 countries, with 70 per cent of the respondents having heard of him, after US President Barack Obama (97 per cent), Russian President Vladimir Putin (91 per cent) and British Prime Minister David Cameron (86 per cent), it said. About 46 per cent of overseas respondents said China's image is one of "having rapid economic growth with its people enjoying relatively high living standards", while 45 per cent believed that China is a country with "a big gap between the rich and the poor". More than half of the respondents are optimistic about China's future development, with 37 per cent saying they believe China's economy will keep growing at a rapid rate, and 20 per cent saying they believe China will overtake the US to become a superpower. The study found that people from emerging economies tend to have a better appreciation of China's development. “Most people in emerging economies regard China as an important force for maintaining world order and peace, while many from the developed countries still believe in a China military threat," he said. Dong Guanghua, group account director of Millward Brown, said the going-global strategy of Chinese companies has also helped improve the country's national image. Chinese brand products, with better quality and innovation, are being embraced by more foreign consumers in recent years, and many foreign respondents are familiar with Chinese brands including Lenovo, Huawei, Air China, Haier and Alibaba, he said. However, Chinese products still need to improve quality and after-sales service, which sometimes hold back foreign consumers from buying Chinese brand products and hamper the national image, he suggested.